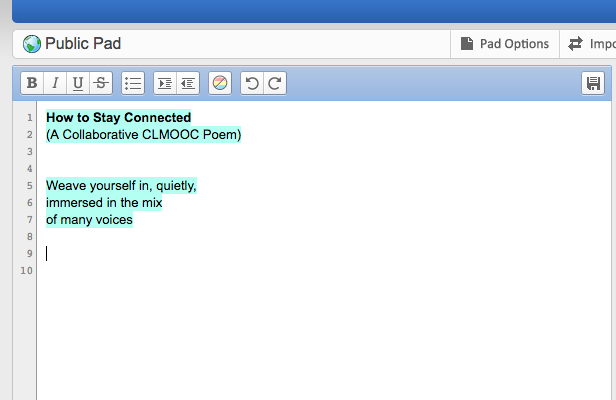 Come add a few lines to a collaborative poem, using a writing platform called TitanPad. No log-in required. Just dive in and add words, or make some poetic edits and revisions. Help “construct” a poem about connections. Since TitanPad (our original space) is dead and dying, the poem has been moved over to an open Google Doc. You can also record the timeline replay with screencasting tools. That is an interesting door to walk through, dontcha think? Note that the “app” is actually a Free Software (open source) tool called Etherpad which was purchased by Google for use in their own tool (Google Docs/Drive/GAPE). TitanPad is public instance.run by somebody (presumably making money on the private documents). While it isn’t needed, I bet CLMOOC could run its own instance of the software.